Stock up for all your upcoming projects with Stampin' UP! 's exclusive double-sided Designer Series paper. We've got so many pretty patterned papers to choose from, you're sure to find the perfect patterns to help you show off your unique crafting style. And the best part is, you'll get a FREE pack of Designer Series paper ($9.95 value) for every three packs you buy-no limits, no restrictions! See pages 170-173 of our Fall-Winter Collection 2007 or our Holiday Mini Collection to see all our Designer Series paper. Or visit us on the web at www.stampinup.com for free fall Designer Series paper project ideas, and start picking your patterns today! 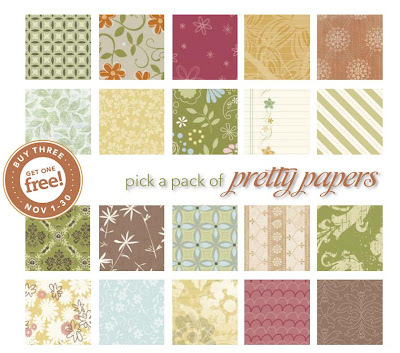 Contact me at meredithcrary@yahoo.com to order your pretty papers today!